Plans for new homes on a school site at the centre of a Barnsley community have been passed despite objections that the council had previously promised to give over the land to provide a shopping centre which is lacking in the area. The site became vacant when Darfield Foulstone School was demolished years ago and part has already been developed for new homes. At the time the council held an exhibition, detailing its ambitions to develop the site, in Nanny Marr Road, for retail with potential for a community centre – a move which would have created a village ‘centre’ in a densely populated area. But the council has failed to attract retailers and by the time a development of 41 homes on the site went before the council’s planning board, the site had already been earmarked for housing under the authority’s Local Plan, a blueprint for future developments which was adopted only three months ago. 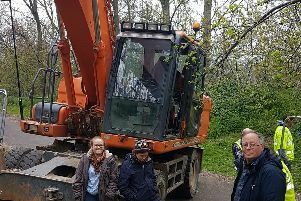 Some planning board members suggested rejecting the housing plan, for the authority to look again at commercial development, but they were told by the council’s head of planning, Joe Jenkinson, the board would be “on a hiding to nothing” if it did so. “There is nothing to try to resist housing on the site, which has been tested,” he said. Under the scheme, one area of land is being left vacant in the hope it will be developed with a convenience store. Mr Jenkinson said Darfield was not deemed a ‘district centre’, like neighbouring Wombwell, and said: “Evidence for the local plan didn’t demonstrate the need for a new district centre. Coun Pauline Markham told the meeting proposals put forwards at an exhibition around seven years ago were “completely different” to the housing proposals, which were approved though seven councillors voted against the scheme. “It was going to be retail, a community centre and two other buildings and people flocked to see it,” she said. “People were really excited about getting their own shopping area in Darfield. We feel let down. This is a once in a lifetime opportunity for this site and we need more retail,” she said. Two residents spoke at the meeting, to raise concerns about road safety and the withdrawl of proposals for retail development. Planning board councillors asked that the remaining land be held specifically for a shop or, if that failed, to be used to create a new green space for the community rather than being given over for further housing in future. Most homes on the site will be ‘affordable housing’, mainly for rent with some open to shared ownership deals. Only six will be sold on the open market.